Local Brisbane developer Velocity Property Group has launched a new 30 dwelling riverside development known as One Bulimba Riverfront. The development features six, top floor, north-facing, riverfront penthouses and 18, north-facing riverfront apartments with sizes ranging from 201 sqm to 393sqm. The project also will feature six townhomes on Byron St, sized from 343sqm to 400sqm, each having pedestrian access to the street. Once the site of several shipyards, Byron Street in Bulimba is currently undergoing rapid change, with five other projects along the riverfront strip also in various stages of development as well as the large redevelopment slated for the Bulimba Barracks which also boarders Byron Street. 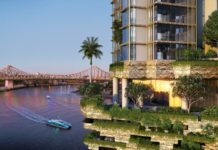 Velocity Property Group Managing Director Brendon Ansell says the size of the residences and direct river frontage delivers exceptional value for anyone wanting to live on the Brisbane River. “All apartments and penthouses are three bedrooms, three bathrooms and most have a media or multi-purpose room. They feature ridiculous amounts of storage and have a wide, open flow from the interior and kitchen through to the living and dining rooms and to the generous balconies beyond, so that each riverfront apartment opens and welcomes the colours and textures from the river into their daily life. “The Penthouses feature stunning finishes of timber flooring throughout and Wolf/Sub Zero appliances including an integrated refrigerator and pyrolytic ovens and warming drawer, plus solar panels and Tesla solar battery to offer a truly exclusive, absolute riverfront lifestyle. Designed by Brisbane Architect Hayes Anderson Lynch Architects, the project has been designed with space in mind for the local downsizer market and has a Mediterranean minimalistic style. 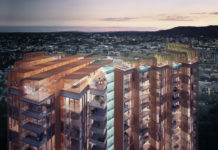 Mr Ansell says the development has strong green credentials featuring energy-saving functionality, incorporating solar panels, inverters and Tesla power walls into the penthouses, while the town homes included solar panels and inverters. “Given that living on the river is also synonymous with boat life, we have applied for an eight-berth marina for ONE Bulimba Riverfront, for which we are awaiting approval,” he said. The project also includes a lap pool that overlooks the river. The apartments are priced from $1.675m to $2.4m, the penthouses are priced from $2.25m to $2.65m and the remaining town homes are priced from $1.7m.